The key to making a good piecrust is making a lot of piecrust. The more you make, the more you get a feel for how far you can push the dough without losing its flaky integrity. I also never worry too much about the filling. I go big– ensuring that the apples mound over the lip of the pie tin. I also have been known to wing it, and if the inside comes out a tad runny, I don’t really mind as long as the top is nice and crisp. 1. To make the piecrust, in a large bowl, combine the flour, butter, and salt. Using your hands, blend the butter into the flour until the mixture forms a coarse texture. 2. Combine the water and vinegar. Gradually add water until you have enough to form a dough—depending on the weather, you might need less water or more. Knead the dough a couple of times, then halve the dough and shape into 2 (1-inch-thick) rounds. Wrap both rounds in plastic wrap and refrigerate. 4. Preheat the oven to 375F. Roll one of the rounds out into a circle about 12 inches in diameter. 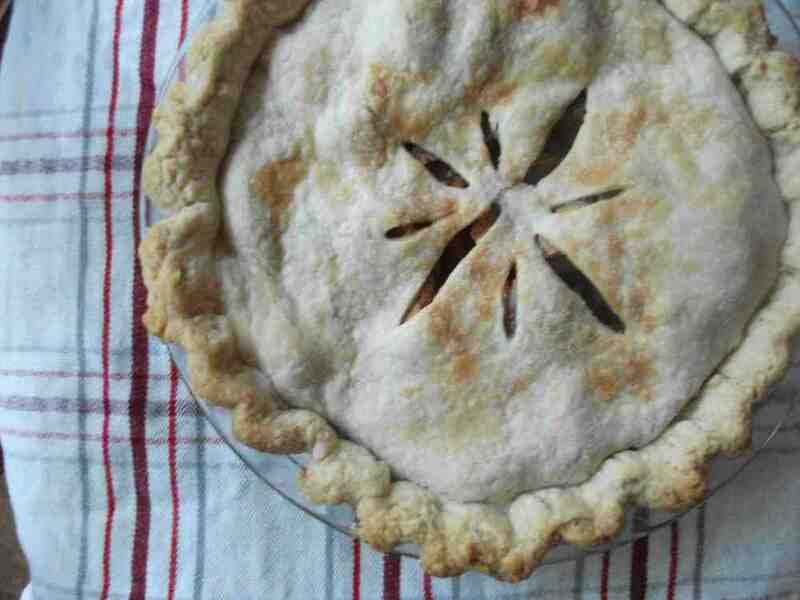 Transfer to a 9-inch pie tin and place in the refrigerator. Roll out the other round into a circle about 12 inches in diameter. 5. Remove the pie tin from the refrigerator. Pour the apple filling (including all of the juices) into the tin, then dot with butter. Dot the rim of the crust with water, then top with the second round of dough. Pinch the top and bottom crusts together, then tuck them under and crimp the edges. Any style will do. Put a few slashes near the center and, if you’re so inclined, sprinkle a bit of sugar on top. 6. Put the pie on a baking sheet (in case it bubbles over – you really don’t want that kind of mess in your oven). Bake for 45 minutes to an hour or until the apples are cooked through and the crust is golden brown.